Could recent breakthroughs in research be applied to make broadly effective vaccines against HIV? Antibodies are among the most effective weapons the body deploys against invading pathogens. These roughly Y-shaped proteins, which can bind to viruses and inactivate them, are thought to be essential to the protection afforded by most, if not all, existing vaccines (see VAX Feb. 2007 Primer on Understanding Neutralizing Antibodies). In recent years, researchers have isolated dozens of antibodies from the blood of HIV-infected individuals that can inactivate, or neutralize, most HIV strains in laboratory tests (see VAX Mar. 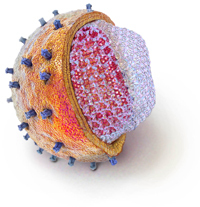 2010 Primer on Understanding Advances in the Search for Antibodies Against HIV). These antibodies are called broadly neutralizing antibodies (bNAbs). Some of them disable HIV at very low concentrations in lab studies, suggesting that they are very potent. AIDS vaccine researchers have in recent years exhaustively studied the structure, biochemistry, and genetics of bNAbs in an effort to design vaccine candidates that might coax the body’s immune system to make similarly potent antibodies against HIV. But that’s easier said than done. In uninfected people, the B cells that produce antibodies only come with a certain inherited set of antibody genes; by combining, or reshuffling, them in many different ways, the immune system generates a variety of B cells that express any one of more than a million different antibodies on their surfaces. Each of those antibodies specifically binds to a particular molecular shape—or an epitope—that is foreign to the body, as are the epitopes found on most pathogens. When such binding occurs, the B cell expressing the binding antibody proliferates and begins secreting millions of copies of that antibody. Although the body can make a variety of antibodies against the Envelope protein found on the surface of HIV, most of them do not neutralize the virus. Meanwhile, bNAbs are only found in a minority of HIV-infected people, and can take years to develop. To better understand why that is the case, researchers have been studying just how bNAbs evolve in HIV-infected people. They have found that B cells need to come in repeated contact with the virus over years to accumulate changes, or mutations, in their antibody genes that enable their antibodies to bind epitopes on the HIV Envelope more efficiently. Eventually, this so-called affinity maturation process leads to B cells that can produce HIV-specific bNAbs that are very different from their unmutated precursors (see VAX Jan. 2011 Primer on Understanding How Broadly Neutralizing Antibodies Evolve). This poses a problem. It suggests that researchers will need to design immunogens—the active ingredients of vaccines—that can drive the required affinity maturation process. Such a vaccine regimen would need to deliver two types of immunogens: those that can bind the unmutated precursors of bNAbs to kick-start the affinity maturation process, and those that can subsequently guide that process toward the desired bNAbs. That is a formidable challenge. But recent research suggests that, at least in principle, developing such a vaccine regimen might be possible. For example, researchers have made immunogens that can bind the unmutated precursors of a potent HIV-specific bNAb known as VRC01. They have made these immunogens either by modifying the naturally occurring HIV Envelope protein, or by creating an artificial molecule that resembles certain parts of HIV Envelope. Researchers have also charted, in unprecedented detail, how bNAbs evolve over the course of two and a half years in an infected patient. They isolated not only the final mature bNAb, but also its unmutated precursors and several intermediate antibodies generated along the way to the bNAb. They found that the primary ancestor of the antibody lineage that led to the bNAb had already appeared 14 weeks after infection. This suggests that a vaccine might be able to induce the kinds of antibody responses that eventually lead to bNAbs faster than previously thought. In the same patient, researchers also isolated many of the viruses that developed mutations in response to the increasingly mature antibody responses. They found that the earliest of these viruses (the version that presumably infected the patient), could bind to the unmutated precursors of the bNAb that eventually developed in this patient. This suggests that this virus kick-started the affinity maturation process that eventually led to the development of bNAbs in this patient. For the first time, researchers can use the series of HIV variants observed in this patient as a blueprint for a series of immunogens that might induce bNAbs like the one isolated from the patient. Researchers plan to make such immunogens to study whether this is the case, first in animals and, eventually, in humans. Combining the right immunogens in the right order, they hope, should eventually induce the maturation of bNAbs in uninfected people much faster than it occurs in infected patients. While this analysis only addressed one type of bNAb directed at one part of the HIV Envelope in one patient, researchers are planning to perform similar analyses of antibody and virus co-evolution in 16 additional patients to understand what kinds of immunogens are needed to induce bNAbs directed at other parts of the HIV Envelope protein. Taken together, such studies could pave the way to the design of vaccines that elicit potently protective responses against HIV.